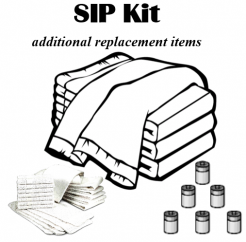 SIP Kit - replacement items are available to the school personnel charged with the task of operating a SIP location in the event of a crisis These SIP Kit replacement items are to be placed in previously sold Keys' SIP Kits. A Crisis/Emergency Kit which is available to the Crisis Team Member to take out of their facility in the event of an Emergency/Crisis. It includes: name tags, notebooks, pens, markers, first aid supplies, tape, placards (that say Parents, Counselors, Media, etc), Crisis Plan, caution tape, student records. Note: Pictures are typical kits and may vary slightly from order to order. Is your Organization or School Prepared? Having Keys' Organization Emergency Kit prior to a crisis or disaster hitting, is an essential part to have sufficient emergency supplies for staff and others readily at hand. Every single month of the school year (August through May), we will issue your school a new batch of our unique Visitor Badges with our innovative time sensitive stickers. 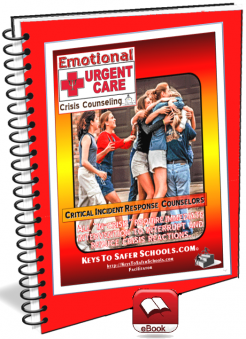 Part of the Emergency/Crisis Action Plan response, used to provide each teacher with a small easy reference flip chart of codes and procedures needed in keeping students safe in an emergency/crisis. 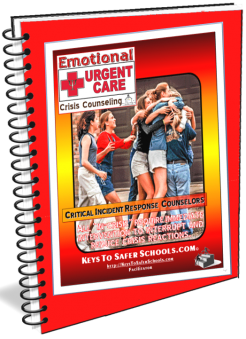 This 60 page workbook provides Counselors (or anyone who works to young people) with pre-developed group exercise instructions and activity handouts for the exercises.